Takamatsu Castle is counted amongst Japan’s top 100 famous castles. It has numerous highlights hidden throughout that will appeal to all castle lovers. Let’s take a look at Tamamo Park, in which the castle ruins are located, with the use of some VR images. The northern side of the castle faces out onto the Seto Inland Sea, while the three remaining sides were surrounded by a series of three moats, an inner, central and outer moat. Takamatsu Castle is referred to as one of Japan’s three great mizujiro ("castles on the water"). The castle’s groundbreaking design drew the sea inside the castle itself, and today sea bream and other fish can be seen swimming in the remaining inner and central moats, which draw in sea water. In the past, the grounds of Takamatsu Castle covered an area several times that of the present day site, and served as the residence of the Matsudaira Clan (who were rulers of the Takamatsu Domain) for 11 generations. To the south, the castle grounds extended as far as the Hoyogomachi and Kataharamachi shopping districts, which are now home to a string of shopping arcades stretching from east to west. The grounds covered an area reaching as far west as the present-day JR Takamatsu Station, and as far east as Kitahamacho and Higashihamacho. 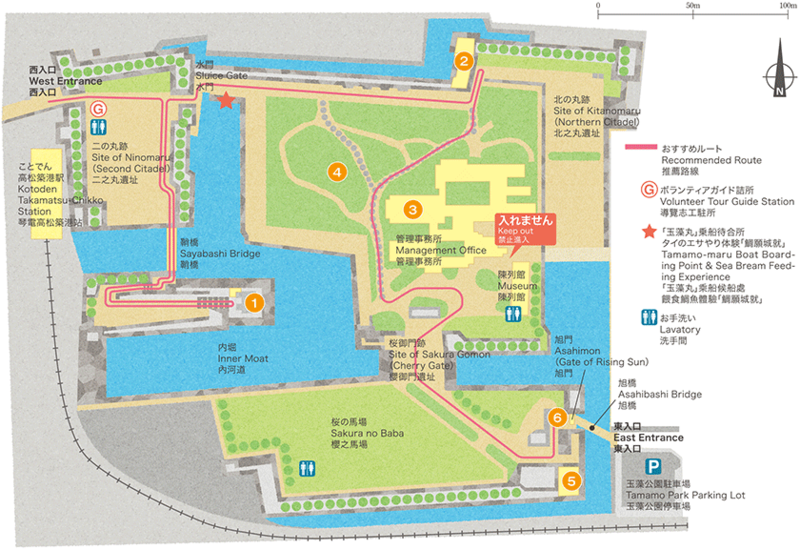 Although the ocean has been filled in as reclaimed land, the surround area has become urbanized, and the castle’s outer moat has disappeared completely, one can still appreciate remnants from the days when this area was contained within the castle itself, from place names such as Nishinomarucho (“western moat town”) and Marunouchi (“within the circle of the outer moat”). The tenshu, or keep, stands at the core of the castle, and is the most symbolic piece of architecture associated with Japanese castles. Today, only the stone wall base of the keep remains. See here for a VR recreation of the tenshu. The original tenshu was a three-tiered structure, with four floors above ground and one underground basement floor. In its day it was the largest in Shikoku, and could be counted as one of the five largest in West Japan. Typically, a castle’s tenshu takes the role of a storehouse, but in the case of Takamatsu Castle it also includes a morogami no ma (a shrine to various deities), and it is said that the first floor also functioned as a religious facility where mass daihannyakyo sutra readings were held. Today, an observation deck has been installed on top of the tenshu platform, providing visitors with an excellent view of the beautifully-pruned pine trees, and the Seto Inland Sea that connects with the castle’s remaining moats. The deck also has an overhanging section. This provides a valuable spot to gaze down at the stone walls from directly above. Do take the opportunity to peer down at the beautifully sloped walls, which were constructed using around 10,000 individual stones. The Tsukimiyagura Turret is situated closest to the sea. The Mizutegomon connected the castle’s moat to the sea itself. During the Edo Period, the shogunate established a policy called sankin kotai, which required the daimyo (feudal lords) of each domain to alternate between living for a year at a time in their own domain and in Edo, the capital. The three-tier, three-story Tsukimiyagura Turret was so named because it was used to view and announce the return of the head of the clan from Edo by boat. Although in Japanese, the word tsukimi usually refers to the Japanese tradition of viewing the autumnal moon, the original name of this turret refers to this function of “watching the arrival” of boats. The head of the clan was also charged with monitoring the other Shikoku daimyo, and so the turret was probably also used to view the movements of ships on the Seto Inland Sea. In the center of the turret there are four large pillars called shitenbashira, which extend upwards as far as the third-floor ceiling. Because the pillars are so tall it was not possible to cut them from a single tree, and on the second floor it can be seen that shorter pillars were joined together. Looking down onto the second-floor roof, visitors can see numerous closely positioned mitsuaoi (three hollyhock leaf) crests, which are the symbol of the Tokugawa shogunate. It is said that such extravagant usage of the crest is quite rare. The castle’s otemon (main entrance gate) is situated adjacent to the south side of the Tsukimiyagura Turret. When leaving the castle for Edo, the head of the clan would board a small boat from here, before changing to his main ship off the coast and heading towards Osaka. The interior of the Tsukimiyagura Turret and the Mizutegomon Gate are opened for public viewing every Sunday, between the hours of 09:00 and 15:00. At opening and closing time, visitors can see the unlocking and locking of the heavy locks, which give a real sense of history. The most distinctive features of the watariyagura (gatehouse with connecting gallery), which was used as a storehouse, are its walls. Here alone, visitors can see three separate types of wall structures. The okabe wall structure was used on the exterior side of the castle. Because it would possibly be subjected to enemy artillery fire, the wall was built thickly, hiding both its upright pillars and horizontal nuki crosspieces. On the interior the castle, the outer wall was built thickly like the okabe, while the inner wall was coated thinly to the extent that the pillars and nuki are visible. The wall surfaces of the namigata shinkabe walls are coated in a beautiful wave-like pattern in order to hide the horizontal nuki passing through its pillars. It is said that this approach was used as a fire prevention measure, to prevent the spread of flames in the event of fire, and also as a means of saving on materials by coating the walls as thinly as possible, although the true reason for its adoption is uncertain. There are few castles in Japan that used this namigata shinkabe wall structure, and it can now only be seen here at Takamatsu, and at Hikone Castle (in Shiga Prefecture). The namigata shinkabe part of Takamatsu Castle was the yaguramon (inner gatehouse) part of the castle built at the time of its construction in 1588, and the watariyagura was subsequently built and joined on as a later addition. The boundary can be seen clearly from the difference in the thickness of pillars on the inside, and the way in which the stones are stacked, which differs from that of the outer side. The Hiunkaku was used as a government office for the Takamatsu domain during the Edo period, and as the residence of the head of the clan. The present Hiunkaku was reconstructed in 1917, and is roughly half the size of the original structure of the Edo period. It served as a second residence for Yorinaga Matsudaira, 12th head of the Matsudaira family, and as a kind of state guest house for important visitors to Kagawa Prefecture. It is now used for tea ceremonies and flower exhibitions, and is only open to visitors during events. Even when it is not open, visitors should pay close attention to the entrance hall ceiling. The top portions of the external lights are decorated with leaves based on a hollyhock motif. The first head of the Takamatsu Matsudaira Clan, Matsudaira Yorishige, was the grandson of Tokugawa Ieyasu; the first shogun of Edo Shogunate. For this reason, the Matsudaira Clan was permitted to use the mitsuaoi (three hollyhock leaf) crests of the Tokugawa family. Also try to find the crests on the onigawara (ogre-faced ornamental roof tiles). The Japanese-style rock garden was created at the same time as the Hiunkaku was reconstructed in 1917. The rooms of the Hiunkaku have names such as Maki (yew plum pine) and Matsu (pine), given according to the trees which can be seen from those rooms. The garden is designed with the aim of achieving harmony with the building itself. There are around 600 pine trees in the garden, one of which was planted during a visit by Emperor Hirohito (while he was Crown Prince).The following year, the Empress Kojun (then his fiancée) also visited, and planted another pine tree alongside it. What really stands out in the garden is the stonework. The bridge over the stone river, including its railings, was carved out of a single giant piece of local Aji-stone. It is a work of art which cannot be created using modern techniques. The garden’s chozubachi (purification trough or water baisin used for rinsing ones hands) is an imitation of one at Ginkakuji Temple in Kyoto, created by a stonemason dispatched especially for the task. The Aji-stone basin weighs approximately 11 tons, and was a major piece of work, which is said to have cost 1/20 of the total cost of creating the garden. The Ushitorayagura Turret was built in the northeastern corner of the grounds in 1677. It was moved to its current location, originally the site of the old Taikoyagura turret, in 1967. The name Ushitora represents the northeasterly cardinal direction in the Chinese earthly branches (zodiac) system, corresponding to the turret’s original position. However, due to its relocation from the northeast to the southeast corner, the directional position of the turret is now different from that of past days. One point for attention is the gun port windows. Although usually these windows would only be installed on the lower levels facing outwards, this turret also has gun ports facing towards the inside of the castle. Circular and square-shaped gun ports are lined up alternately on all levels of the turret, showing that greater attention was paid to design aspects than simply the original purpose of these windows. The Asahimon Gate is the castle’s otemon (main entrance gate). Before the inner gate, there is an enclosed, square-shaped courtyard called a masugata, from which defenders could rain down attacks on attacking enemy soldiers from all sides. The stone walls surrounding the square courtyard are laid using a method called kirikomihagi, in which large, carefully-chiseled stones are laid such that they fit tightly together with no gaps. Although the majority of Takamatsu Castle’s stone walls were built using the nozura ranseki method, in which unprocessed natural stones of various sizes are packed together to create the wall, the walls surrounding the masugata courtyard were built using large stones and this imposing building method, due to the fact that the Asahibashi Bridge and Asahimon Gate serve as the castle’s main entrance. The remaining stone walls adjacent to the masugata courtyard are where the yaguramon gatehouse once stood. Small stones were used only on the stone walls around the left and right of the center.When the gates are opened, these parts of the walls cannot be seen. This gives us an insight into how the castle's builders used large, cleanly cut stones for the parts of the walls which would be seen by people, and reduced construction costs by using small stones for the unseen parts. There are various other interesting points to be seen around the castle, including mysterious carvings in the stone walls, and the elegant glass used in the Hiunkaku windows. Please take your time to look carefully around the castle so that you do not miss other features of the fascinating ruins and fine decorations.